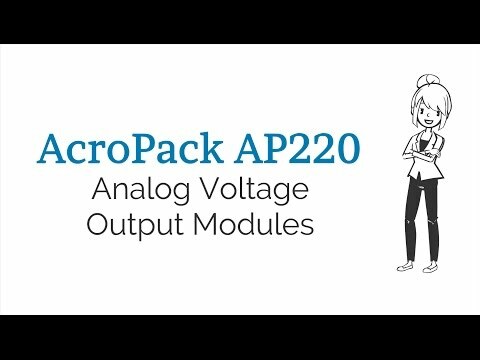 The AP220 outputs analog voltage signals to drive up to 16 devices. When used with a carrier that holds two AcroPack AP modules, up to 32 voltage outputs can be obtained from a single card cage slot. Each output channel has its own 12-bit D/A converter (DAC). Individual DACs are faster, and they eliminate glitches typically caused by the re-acquisition process of sample and holds found on multiplexed output boards. Individual channels also have double-buffered data latches. You can select to update each output when it is written to, or to update all outputs simultaneously. Simultaneous outputs better simulate linear movements in motion processes. Designed for COTS applications these analog output modules deliver high-density, high-reliability, and high-performance at a low cost. AcroPack modules are RoHS compliant and ideal for military, defense, automation, aerospace, scientific, and development labs industries. The AcroPack® product line updates our popular Industry Pack I/O modules with a PCIe interface format. This COTS tech-refresh offers a compact size, low-cost I/O, the same functionality and memory map of the existing IP modules in a rugged form factor. Combine different AcroPack modules on one carrier for a simplified modular approach to system assembly. The AP220 modules are 70mm long, 19.05mm longer than the full length mini PCIe card. The board’s width is the same as mPCIe board and use the same mPCIe standard board hold down standoff and screw keep out areas. A down facing 100 pin Samtec connector will mate with the carrier card. Fifty of these signals are available as field I/O signals. The AP220 supports 6 independent software selectable output ranges plus capabilities to monitor the status of each output. Output configuration: 16 non-isolated bipolar/unipolar differential outputs. Each channel is paired with a signal return reference. Output ranges: Unipolar: 0V to 5V, 0V to 10V. BiPolar: -2.5V to 7.5V, ±-3V, ±5V, ±10V. Settling time: 9uS - 20V step to 1 LSB at 16-bit resolution. 7.5uS - 10V step to 1 LSB at 16-bit resolution. Maximum throughput rate: Outputs can be updated simultaneously or individually. One channel: 7.5μS/conversion. Sixteen channels simultaneously: 17μS/16 channels. Calibrated system accuracy: Linearity error: ±0.5 LSB. Offset error: ±0.0625 LSB. Gain error: ±0.0625 LSB. Total error: ±0.625 LSB (±0.0152% FSR) maximum. Data format (left–justified) Straight Binary or Two’s Complement. Output at reset: 0 volts. Output current: 10mA (maximum). This corresponds to a minimum load resistance of 1K ohms with a 10V output. Short circuit protection: Indefinite at 25°C. Alarm function: Software readable for brownout, short-circuit and temperature exceeding 150 °C conditions. Conforms to PCIe base specification Revision 2.1. Lanes: 1 lane in each direction. Bus Speed: 2.5 Gbps (Generation 1). Memory: 4k space required. 1 base address register. Storage temperature: -55 to 150°C. MTBF: 4,094,686 hrs. at 25°C, MIL-HDBK-217F, notice 2. Power: +3.3 VDC ±5% 400mA Typical, 480mA Maximum. +12 VDC ±5% 85mA Typical, 275mA Maximum. -12 VDC ±5% 50mA Typical, 200mA Maximum. Note: AcroPack modules are compatible only with the carriers listed in the accessory section of this page. Mix and match countless I/O combinations in a single slot. Internally stored calibration coefficients ensure accuracy. Software provides easy selection of transparent or simultaneous output modes. Double-buffered DACs allow new data to be written to each channel before the simultaneous trigger updates the outputs. 12-bit DAC module, 16 channels, analog voltage output.